Scaffolding projects in ‘built up’ residential areas present a different set of problems for scaffolders and contractors than industrial scaffolding projects. With residential projects there will often be neighbours living close by who are already being inconvenienced by building works and may be sensitive to any kind of further disturbance. Although scaffold sheeting is usually installed to screen the construction work, the type of scaffold sheeting used can affect residents if it looks unsightly or flaps noisily in the wind at night. Schemes such as ‘Considerate Constructors’ specifically refer to the external appearance of the site and ways in which the impact on local residents can be minimised and in recent years we have noticed more and more projects in ‘built up’ areas like Central London where a smart appearance of the scaffold sheeting has been a key requirement of the scaffolder or contractor. 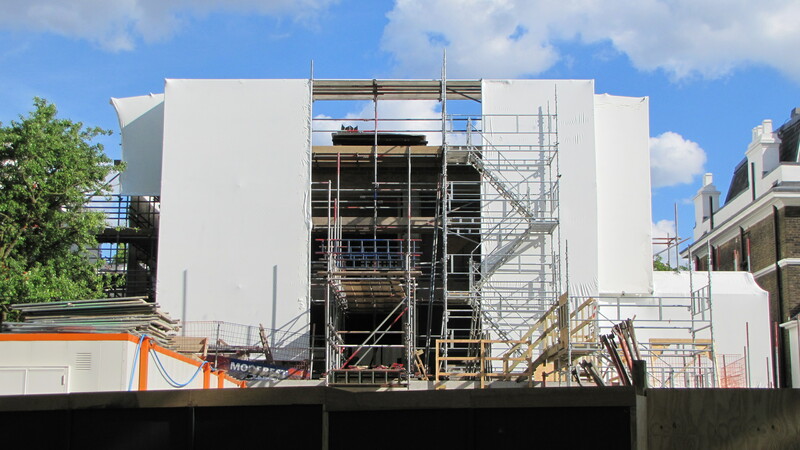 This article looks at some of the sheeting options available to a scaffolder and contractor. We will compare conventional scaffold sheeting, building wraps and shrink wrap. The focus of this article is the appearance of the scaffold sheeting. Conventional ‘individual sheet’ scaffold sheeting is the ‘entry level’ solution. It is widely available and can be purchased for as little as 50 pence per square metre if you are not too worried about the brand / quality). When fixed properly, conventional scaffold sheeting can look fairly smart and might be the best choice for relatively short term requirements. 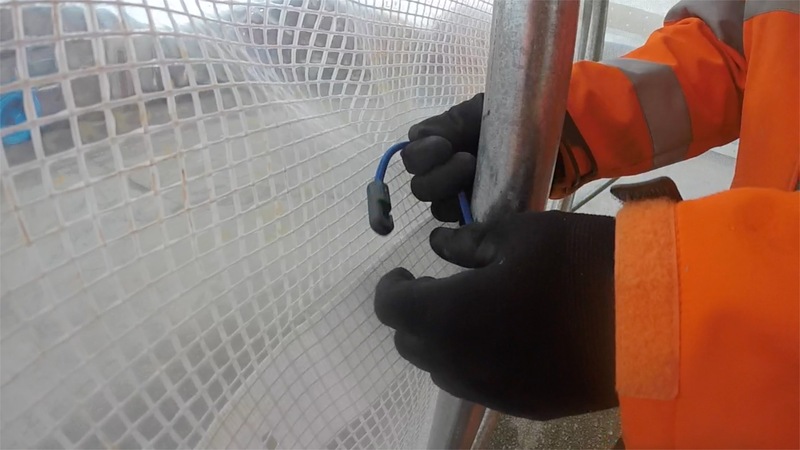 However, because this type scaffold cladding is attached to the scaffolding by elasticated bungee cords, over time these cords tend to become stretched and lose elasticity. At this point the sheeting sags and becomes loose which affects the appearance and may even lead to the sheeting detaching altogether if the wind is strong enough. Another possible issue with traditional scaffold sheeting products is that even when first fixed, the sheeting will not be fixed very tightly around the scaffolding. This can lead to flapping against the scaffolding tubes in breezy conditions which may create a noise disturbance for local residents. At the other end of the cost scale is building wraps. These are digitally printed mesh banners that can be applied to scaffolding structures or even direct to the facade of the building. The graphics are printed as strips which are then joined by heat welding them together. The price of a building wrap will vary but is typically measured in the tens of thousands. Shrink wrap sheeting for scaffolding can solve many problems associated with screening construction projects in built up areas. Because all joints between sheets, in a similar way to building wraps, are heat sealed, the shrink wrap creates a ‘continously bonded skin’ around a scaffolding, no matter what the size or shape of the scaffolding. Unlike building wraps which tend to be a mesh, shrink wrap also acts a temporary weatherproofing, and contains any dust and debris generated by the construction work. The cost of shrink wrap sheeting will tend to be higher than conventional scaffold sheeting but much less than building wrap. The main disadvantage of shrink wrap compared with a building wrap is that shrink wrap cannot be pre-printed with a overall graphic like building wraps. This is because the shrink wrap sheeting is heat shrunk drum tight around the scaffolding structure and this would lead to some distortion of a detailed graphic Also, shrink wrap is generally supplied as a 7m wide roll. Even the latest high tech super wide digital printers costing in excess of £250k cannot print wide enough for scaffold shrink wrap. the shrink wrap creates a ‘continously bonded skin’ around a scaffolding, no matter what the size or shape of the scaffolding. Where building work needs to be screened from local residents in a smart and professional way conventional ‘individual sheet’ scaffold cladding, fixed around the scaffolding on a ‘lift by lift’ basis may be sufficient for short term projects but is unlikely to be a medium to long term solution. Building wraps provide an extremely professional scaffold covering but can be costly and do not provide much in the way of weather protection or containment of dust. Shrink wrap sheeting ‘sits’ somewhere between conventional scaffold sheeting and building wraps, it is fixed tightly and although it cannot be printed like a building wrap, it is possible to apply branding if required, through applying self adhesive vinyl signs. Whichever scaffold sheeting option you decide to go for, when it comes to creating the smartest possible appearance, how you set up the scaffolding structure is essential. You can find out more about setting up a scaffold structure for shrink wrapping here but in general the scaffolding structure must be flush. Furthermore, for the very best results, constructing an additional scaffold frame just for the sheeting will keep sheeting away from braces and fittings. Also, for best results there need to be some advance planning. 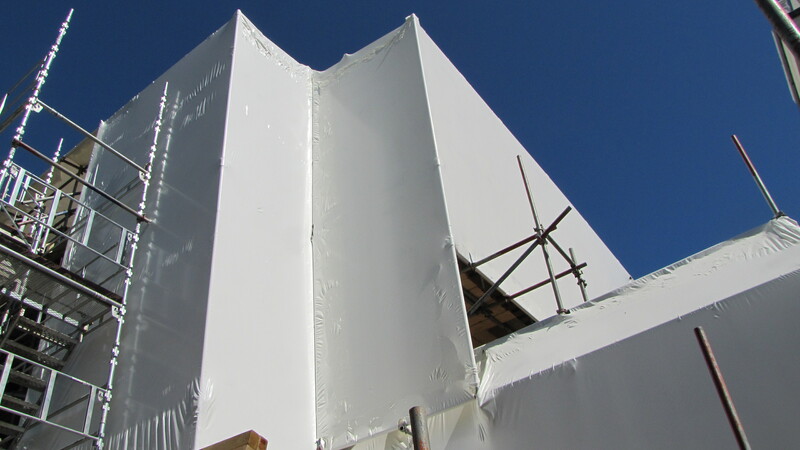 When Rhino Shrink Wrap worked with Skanska on St Barts Hospital in Central London, the ways in which the sheeting was to be fixed was planned many months in advance. You can read a ‘case study’ on this project here.